Kilt is one of those items of clothing so steeped in association and connotation it can be a daunting prospect to tackle, but Jeremiah Ogbodo just proved us wrong while turning at Veuve Clicquot‘s #Yelloweek over the weekend. Guys would you rock this outfit? 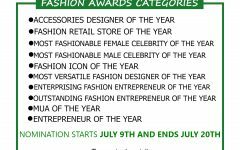 Nominations for the Fashion and Humanitarian Awards Categories Begins!